In this third article on getting started with Git, learn how to add and delete Git branches. In my two previous articles in this series, we started using Git and learned how to clone, modify, add, and delete Git files. In this third installment, we'll explore Git branching and why and how it is used. Picture this tree as a Git repository. It has a lot of branches, long and short, stemming from the trunk and stemming from other branches. Let's say the tree's trunk represents a master branch of our repo. I will use master in this article as an alias for "master branch"—i.e., the central or first branch of a repo. To simplify things, let's assume that the master is a tree trunk and the other branches start from it. If you are creating a new feature for your project, there's a reasonable chance that adding it could break your working code. This would be very bad for active users of your project. It's better to start with a prototype, which you would want to design roughly in a different branch and see how it works, before you decide whether to add the feature to the repo's master for others to use. 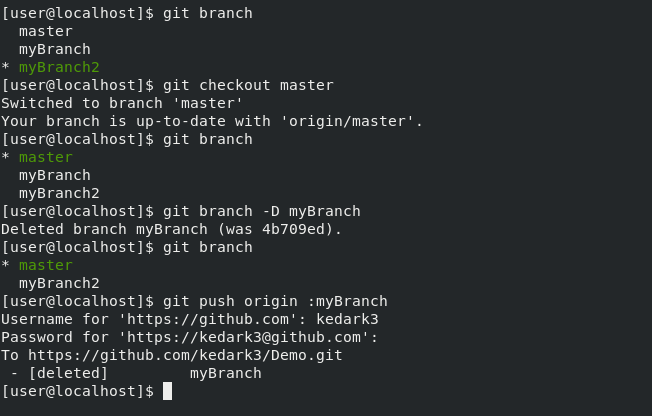 The first command, git status reports you are currently on branch master, and (as you can see in the terminal screenshot below) it is up to date with origin/master, which means all the files you have on your local copy of the branch master are also present on GitHub. There is no difference between the two copies. All commits are identical on both the copies as well. The next command, git checkout -b myBranch, -b tells Git to create a new branch and name it myBranch, and checkout switches us to the newly created branch. Enter the third line, git status, to verify you are on the new branch you just created. As you can see below, git status reports you are on branch myBranch and there is nothing to commit. This is because there is neither a new file nor any modification in existing files. The first command, echo, creates a file named newFile, and cat newFile shows what is written in it. git status tells you the current status of our branch myBranch. In the terminal screenshot below, Git reports there is a file called newFile on myBranch and newFile is currently untracked. That means Git has not been told to track any changes that happen to newFile. The next step is to add, commit, and push newFile to myBranch (go back to the last article in this series for more details). git commit -m "Adding newFile to myBranch"
In these commands, the branch in the push command is myBranch instead of master. Git is taking newFile, pushing it to your Demo repository in GitHub, and telling you it's created a new branch on GitHub that is identical to your local copy of myBranch. The terminal screenshot below details the run of commands and its output. If you go to GitHub, you can see there are two branches to pick from in the branch drop-down. Switch to myBranch by clicking on it, and you can see the file you added on that branch. Now there are two different branches; one, master, has a single file, README.md, and the other, myBranch, has two files. git commit -m "Adding newFile2 to myBranch2"
I won't show this terminal output as I want you to try it yourself, but you are more than welcome to check out the repository on GitHub. Since we've added two branches, let's delete one of them (myBranch) using a two-step process. git branch lists the available branches; checkout changes to the master branch and git branch -D myBranch removes that branch. Run git branch again to verify there are now only two branches (instead of three). as -d (or --delete) also tells GitHub to remove your branch. Now that we've learned about using Git branches, in the next article in this series we'll look at how to fetch and rebase branch operations. These are essential things to know when you are working on a project with multiple contributors. Kedar Vijay Kulkarni - Kedar is a Software Quality Engineer at Red Hat working with CloudForms(upstream ManageIQ) project and primarily looking at integration of Ansible with CloudForms and Remote Consoles for various Cloud/Infrastructure Providers. In his free time he likes to Travel, watch interesting videos, learn about new technologies. Happy 14th anniversary Git: What do you love about Git? Git is an excellent tool, both for working collaboratively and for those who work alone. Congratulations on this great tutorial. Very good tutorial. I really like this series. Looking forward to part 4! Connect with Opensource.com editors, community moderators, and writers on Freenode IRC in the #opensource.com channel.